Hi Everyone! My name is Colleen Ruska and I am the Reservations Supervisor here at The King and Prince. I have seven years of hospitality experience-specifically working in Historic Hotels in New York and Georgia and I am happy to call St. Simons Island my home. Our most economical rooms are the Standard rooms, most of which have two queen beds and are simply appointed with comfortable furnishings and a small kitchenette. The Resort View and Partial Ocean View rooms are mid-priced rooms located both in the Historic Building and in the Oleander Building. The Partial Ocean view rooms in Oleander are one of my favorite room types because of the location, nice view and size of the rooms. Because the rooms are so spacious, these rooms are also appealing for families. The view from our Ocean Front rooms cannot be beat. What could be better than watching the sun rise over the Atlantic and watching the Dolphins play in the water from the comfort of your own balcony! The Cabana rooms are by far our most requested room type. These ground floor Ocean Front rooms have an unobstructed view of the ocean and they are so close that you can fall asleep listening to the waves crashing on the shore. 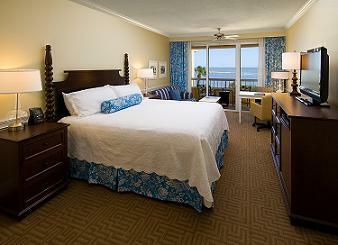 Rooms in the Oceanfront Building sit behind our main pool. The location gives you a great view and easy access to the pools and the beach. They are our most recently renovated rooms and feature a contemporary décor. I could say so much more about our room types and I have not even had a chance to write about our Resort Residences and Beach Villas! I hope this blog has given you some insight into our accommodations. Please be sure to check back in the future for updates and more information about our rooms.